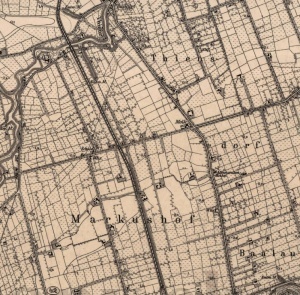 Detailed map of Thiensdorf and Markushof, early 20th century. Source: Catalogue of Monuments of Dutch Colonization in Poland website. 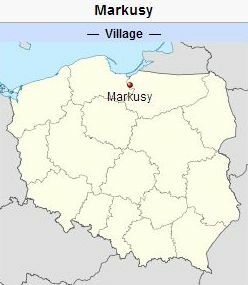 Markushof (also known as Merkelshof and Marcushoff; now known as Markusy; coordinates: 54.048611, 19.383889 [54° 2′ 55″ N, 19° 23′ 2″ E]; population in 1905, 606; in 1939, 633; in 2012, 580) is a village located in what was formerly the Klein-Werder of Marienburg, formerly West Prussia, Germany, and now in the Warmian-Masurian Voivodeship, Poland. It lies approximately 6 kilometres (4 miles) south of Elbląg (Elbing) and 79 km. (49 mi.) west of the regional capital Olsztyn (Allenstein). Markushof was founded in 1363. In the Middle Ages, it had a manor house with a chapel. In 1590, Simon Bahr signed a contract for settling Dutch colonists in the village. Most of the Dutch settlers were probably Mennonites. They suffered severely from many hardships; repeatedly Markushof was flooded by the Vistula River (very severely on 21 April 1681, and in 1737). In these calamities they were financially supported by the Dutch Mennonite Committee of Foreign Needs. In May 1724 a number of Mennonites expelled from Lithuania temporarily settled near Markushof, among whom was Elder David Penner. On 31 January 1744 a conference of several West Prussian congregations was held at Markushof to face the new situation when the King of Prussia had granted freedom of religion to the Mennonites. The Mennonites living at Markushof belonged to the Frisian congregation of Thiensdorf. The sources from 1776 mention the following surnames: Allert, Bastvader, Boll, Dau, Froes, Froese, Gruntu, Harms, Holtzrichter, Jantzen, Lambert, Martens, Neysteter, Nickel, Puls, Penner, Peters, Philipsen, Quiring, Ridiger, Schroetter, and Siebert. 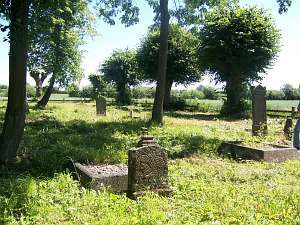 In 1790, after 12 years of strife, about 400 persons, with four preachers and five deacons, withdrew from the Thiensdorf congregation, which had a membership of 2,000 (including children). The smaller group and the congregations of Orlofferfelde and Danzig wanted to continue to permit mixed marriages between members of the Frisian and Flemish groups, which had been allowed in the Frisian churches until 1772, and to accept the children of these marriages as well as others who wished to join by baptism. The larger part of the Thiensdorf congregation and four other Frisian congregations rejected this position. On 21 April 1791 the papers of the division were signed. The smaller group then built a church in Markushof, in which Elder Heinrich Donner of Orlofferfelde preached the first sermon on Christmas Day. In 1792 Johann Sperling (1729-1802), the first elder of the congregation, was ordained by Donner. After Sperling suffered a stroke in 1799, he was succeeded as elder by Dirk Allert (b. ca. 1760). The membership remained at about 450, including children. The baptized membership in 1852 was 288, and in 1887, 292. The elder of the Markushof congregation then was Heinrich Wiehler (from 1860) and the preachers were Cornelius Wiehler, Hermann Pauls, and Franz Wiehler. Differences began to disappear and some cooperation became possible. In 1865 Thiensdorf built a new church. Elder Siebert of Markushof invited Thiensdorf to use his church during the building. The preachers of the two groups then preached on alternate Sundays, and in the autumn communion was observed on two Sundays served by both elders together. On 25 March 1888 the Nogat River broke through its dam near Jonasdorf, and seriously damaged the Markushof church. Then the Mennonites of Holland, Hamburg-Altona, and Danzig raised a considerable sum to be given for a new church on condition that the Thiensdorf and Markushof groups merge and build a church at Preussisch Rosengart instead of Markushof, which is near Thiensdorf. On 4 March 1890 the united group adopted the name Thiensdorf-Markushof. The old church was repaired to the extent that services could be held in it until the dedication of the church in Preussisch-Rosengart on 14 June 1894. Until 1772 the village was located in what was known as Royal Prussia (also known as Polish Prussia) in the Kingdom of Poland. The First Partition of Poland in 1772 resulted in the creation of a new province in 1773, called West Prussia, in which the village was located. The village was situated in the district (Kreis) of Marienburg until the end of World War I, when it came under the jurisdiction of the German province of East Prussia. At the outbreak of World War II in 1939, it came under the control of Nazi Germany. In February 1945 it was occupied by Soviet forces and eventually returned to Poland. In 2012 it was a village in the administrative district of Gmina Markusy, Elbląg County, Warmian-Masurian Voivodeship. In 1820, the village had 418 residents, including 162 Mennonites. In 1885, the village had 54 homesteads, 5 large farms, 76 houses, 689 Lutherans and Catholics, and 139 Mennonites. Hege, Christian and Christian Neff. Mennonitisches Lexikon, 4 vols. Frankfurt & Weierhof: Hege; Karlsruhe: Schneider, 1913-1967: v. III, 43. Hoop Scheffer, Jacob Gijsbert de. Inventaris der Archiefstukken berustende bij de Vereenigde Doopsgezinde Gemeente to Amsterdam, 2 vols. Amsterdam: Uitgegeven en ten geschenke aangeboden door den Kerkeraad dier Gemeente, 1883-1884: v. I, Nos. 1571-1579, 1649, 1666, 1679, 1683, 1688, 1696; v. II, Nos. 2626, 2635, 2650; v. II, 2, Nos. 735, 808, 8561. Mannhardt, H. G. Jahrbuch der Mennoniten-Gemeinden in Ost- und Westpreussen (1883): 17, 19; (1888): 12. Schapansky, Henry. Mennonite Migrations (and the Old Colony, Russia). New Westminster, BC: Henry Schapansky, 2006: 133. Stowarzyszenie Konserwatorów Zabytków. "Markusy." Catalogue of Monuments of Dutch Colonization in Poland. 2005. Web. 6 October 2012. http://holland.org.pl/art.php?kat=obiekt&id=381&lang=en. Szper, Felicia. Nederlandsche nederzettingen in West-Pruisen gedurende den Poolschen tĳd. Enkhuizen: Bais, 1913: 121, 125, 171 note 3. Wikipedia. "Markusy." Web. 12 February 2013. http://en.wikipedia.org/wiki/Markusy. Wolf, Hans-Jürgen. "Familienforschung in Westpreußen." Web. 12 February 2013. http://www.westpreussen.de/cms/ct/ortsverzeichnis/details.php?ID=4190. Mennonite Library and Archives, Bethel College, North Newton, KS. Thiensdorf and Markushof Mennonite Church Record Books. Driedger, A., Nanne van der Zijpp and Richard D. Thiessen. "Markushof (Warmian-Masurian Voivodeship, Poland)." Global Anabaptist Mennonite Encyclopedia Online. October 2012. Web. 20 Apr 2019. http://gameo.org/index.php?title=Markushof_(Warmian-Masurian_Voivodeship,_Poland)&oldid=163028. Driedger, A., Nanne van der Zijpp and Richard D. Thiessen. (October 2012). Markushof (Warmian-Masurian Voivodeship, Poland). Global Anabaptist Mennonite Encyclopedia Online. Retrieved 20 April 2019, from http://gameo.org/index.php?title=Markushof_(Warmian-Masurian_Voivodeship,_Poland)&oldid=163028. Adapted by permission of Herald Press, Harrisonburg, Virginia, from Mennonite Encyclopedia, Vol. 3, pp. 490-491. All rights reserved. This page was last modified on 13 January 2019, at 18:44.